Nancy Wilson is a native of Atlanta and received her undergraduate degree from Georgia State University. She has studied flute with Warren Little, Marion Valasek, Kareen Britt, Amy Porter, Christina Smith, Tadeu Coelho, and Carl Hall. Since 1971, she has maintained an active private studio teaching all levels of flutist from 4 years old to retirement age. Formally a middle school band director, she has had experience working, planning and assessing very large programs as well as working with flute sectionals for marching band, concerts and masterclasses. She loves working with flute choirs and giving individual private instruction. She is very supportive and involved with the local flute community and its educational advancement as well as continuing her own personal music education. Nancy continues her studies yearly by attending the National Flute Association Convention which offers many avenues of education. She participates in local and national masterclasses, workshops and attends the Tadeu Coelho annual Inspiration and Praise Flute Materclass, a five day study program. With the Atlanta Flute Club she helps to bring nationally know artists to the Atlanta area to give workshops and masterclasses. Mrs. Wilson performance experience includes the Emory University Wind Ensemble, the Atlanta Community Orchestra, Georgia Perimeter College Wind Ensemble, the Dekalb College Wind Ensemble, the Dekalb Symphony Orchestra, the Colorado Flute Orchestra, the National Flute Association Professional Flute Choir, the Embry Trio, as well as many metro Atlanta area churches. Currently she performs with the Peachtree Symphonic Winds (section leader), the Flute Choir of Atlanta, the Atlanta Flute Ensemble, and Papageno Flute Quartet. She is assistant conductor of The Atlanta Metro Youth Flute Choir. 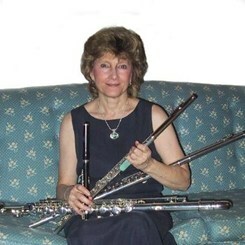 She is past-president of the Atlanta Flute Club and Flute Choir of Atlanta. Currently she serves on the Atlanta Flute Club board as membership coordinator as well as founder/coordinator of the annual Flute Choir Extravaganza. She is a member of the National Flute Association, Mid-South Flute Society and the Florida Flute Association. Request Lessons with Nancy today!